I was thinking of spending an extra day in western Wyoming, but after being away nearly five weeks, home is beginning to sound appealing. So I’m adding western Wyoming to my list of places to come back to another Fall. One day would never be enough, anyway. At least a week would be needed to capture the beauty I discovered there. Driving through the mountains south of Lander, the colors around me were nothing short of spectacular. 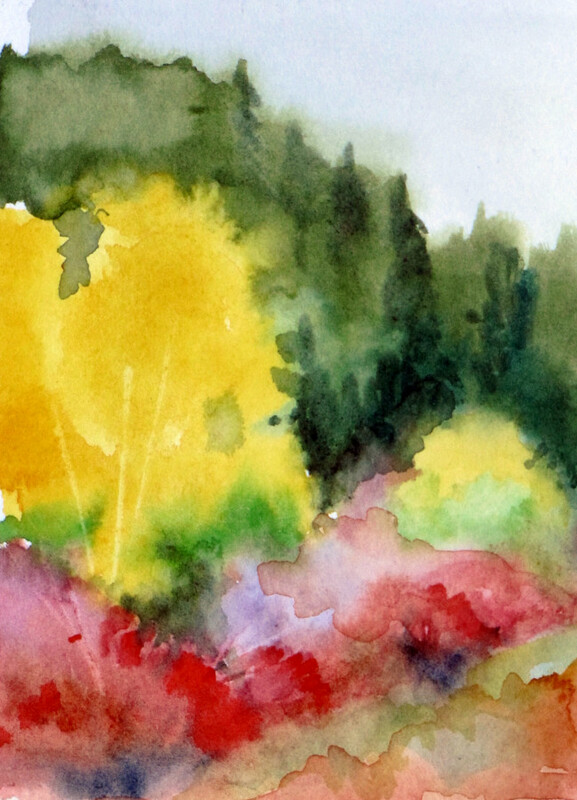 Brilliant yellows, oranges and reds contrasted with the deep green of conifers. Even thought it was an overcast day, the colors glowed as if the sun was shining on them. I don’t think I’ve ever seen anything so vibrant. With color like this, ink simply won’t do. I tried a small watercolor to try to get some of the colors I saw. It’s simple and abstract, but enough to remind me of the scene until I can get back for more. Entering the southeast corner of Idaho, rugged scenery and ranches continue. 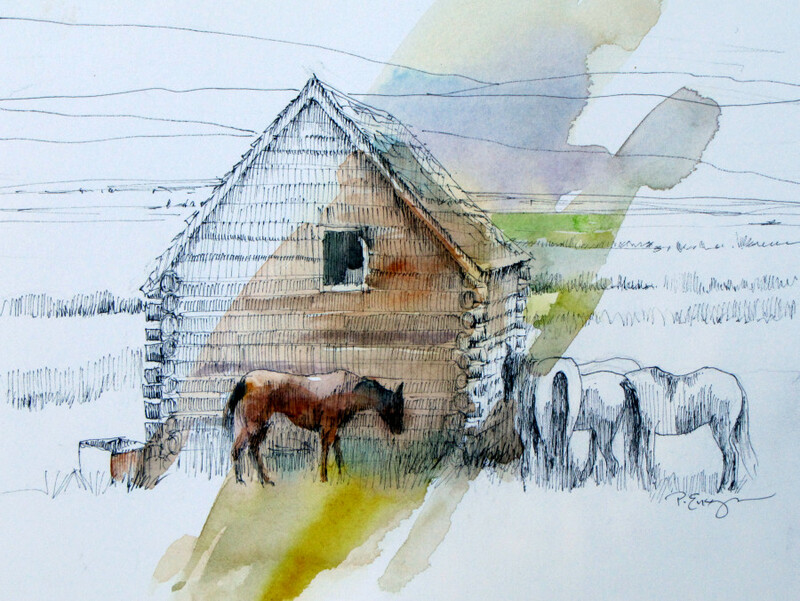 When I saw this classic western scene of horses grouped by an old log building, I had to draw it. Horses aren’t exactly my area of expertise, but it’s always fun to try something new. Idaho, like many of the other western states has varied scenery, from flat and barren to mountainous and forested. Since I usually drive across the panhandle to the north, I had forgotten how wide the state is to the south. It took most of the day to make it to Oregon. Not much farther now.